Mama Said..Don't Play With My Food, but I didn't listen.. Good Thing! Food is a glorious thing, and beautiful images of food speak to our senses, leaving us hungry for more. However, creating these images may look easy, in fact it can be quite a challenge. Food can get messy, wilt & discolor without paying attention to every detail to proper food handling for the set. It basically behaves badly and needs TLC. 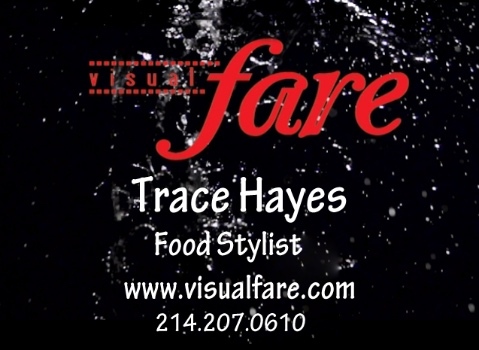 My name is Trace Hayes, creator of Visual Fare Food Styling. I know the inherent challenges with food and how to address them as 40 years 'food'experience has enabled my natural progression from Professional Chef to Food Stylist 24 years ago. Translating food ideas, compositions & presentation to film art takes creativity, a deep well of patience and sheer innovation, to capture of food at peak freshness. The food and drink galleries on this website, showcase styling accomplishments and easily categorizes the images in their respective gallery. Iv tried to make looking for examples of certain foods for your specific projects easy, as with all service we offer. Visit my Client page for a partial list of past and present VisualFare clients. Additionally, The VisualFare Online Store offers my Twice as Nice Ice, indispensable to food and prop stylists and photographers. Enjoy the styling magic in the gallery pages, shop the store if you're looking for synthetic, yet artful ice, and of course, 'Bon Appetite' for your eyes! Twice as Nice Ice * On Sale Now! Beautiful drink images, one of my specialties, often call for the use of acrylic or “fake” ice. Much of the acrylic ice that is currently available online or at prop houses is designed in a square shape with square edges. This shape tends to stack inside a glass or container in a brick-like pattern which is neither natural looking nor photogenic, and obviously, looks fake. This type of ice is typically used for wide or distance shots, (such as a room full of people with drinks in front of them). I invented Twice as Nice Ice because the current cubes simply weren't good enough for my clients requiring close up drink images. Twice as Nice Ice is the only acrylic ice on the market that can produce the look of natural ice; a look highly sought after by professional stylists and photographers. It is available for purchase on this site at our VisualFare Store.